Maximize space and keep everything organized with plastic clear-view storage containers with lid. Latch ensures that contents remain in place and the clear base allows items to be located quickly. We use these in different sizes to store all types of different PE equipment. Each size gets the job done. 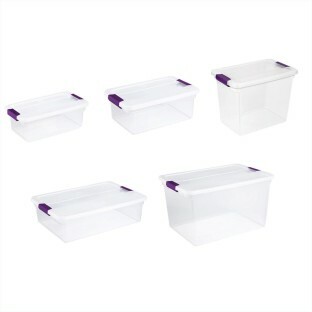 Great storage options - there is a size for every need. Loved that I could order this through the mail! Use to store toys and crafting items. Very durable and comes in many sizes.